Let us begin with thanking Sega Anthology for these amazing high quality pictures of his Dreamcast! Sega Anthology: "The Sega Dreamcast is one of the most iconic Sega consoles ever created. It did not do so well with the competitors but it was a beauty to look at. And it had the most coolest looking games and accessories". A lot of Limited Editions where released as well. 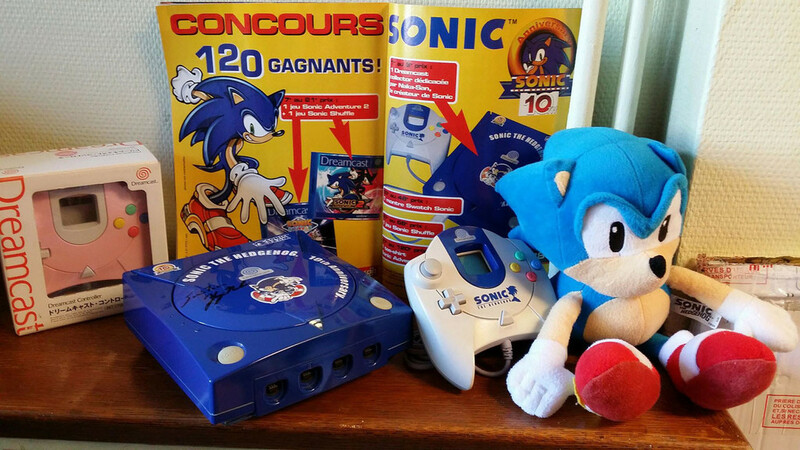 One of the rarest (and coolest looking) is the Sonic 10th anniversary Dreamcast! The Sonic the Hedgehog 10th anniversary Dreamcast is a beautiful blue Dreamcast to commemorate the 10th anniversary of Sonic the Hedgehog. The console is from Europe, also the logo on the controller is blue, representing the European Dreamcast logo. Sega Anthology has 2 different variations of the console, one is signed by Yuji Naka (head of Sonic team, lead programmer of the original Sonic the Hedgehog) and one that is not signed. 40 consoles were sent out to SoE (Sega of Europe) employees to thank them and 10 were shipped to France to give away for magazine lotteries. Why? We don't know! Luckily, we have found some of the scans of the official contest where you could win the console! French magazine "Consoles +" gave away 6 of them, another magazine the other 4.